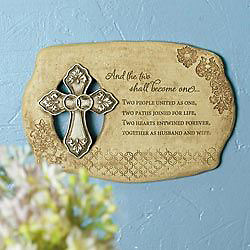 Text reads: " And the two shall become one... two people united as one, two paths joined for life, two hearts entwined forever, together as husband and wife." Plaque is crafted of resin with cut-out detail and cross design highlighted in metallic paint. Ready to hang. Approx. 8 7/8" x 6".